Some more on the Safeway saga…. I guess this isn’t entirely surprising—after all, much of the retail that was built around the time this Safeway went in looks something like a suburban strip mall. Check out the former Safeway (now Grocery Outlet) on Auto Row at the corner of 29th and Broadway, for instance—it was the cat’s meow when it opened in the 1960s, but today it sticks out like a sore thumb with its massive surface parking lot along the street. And don’t get me started on the Kaiser M/B Center, which used to be a suburban-style mall anchored by Mayfair Market, a Bay Area supermarket chain. (Interestingly, the M/B Center was built in the mid-1960s to replace a 1930s-era Arthur Williams grocery store that was one of the first supermarkets to open in California and one of the first in the nation to have a surface parking lot. What a long, strange trip it’s been since then…) Thankfully, the M/B Center is currently being demolished to make way for the new Kaiser Hospital—a little more is gone every day! So, yeah. Sadly my excitement waned pretty quickly once I got a look at Safeway’s vision for the renovated plaza. Basically, it’s more of the same. I won’t spend a lot of time attacking it, since you can find plenty of good summaries of the problems—along with proposals for alternative designs—in other places in the blogoaksphere. But I did want to take a moment to weigh in on the bike and pedestrian problems with the proposal, since I think we’re in the minority of Oaklanders who currently bike and even occasionally walk to this plaza, and would do so much more frequently if it were actually safe to be a cyclist or pedestrian there. 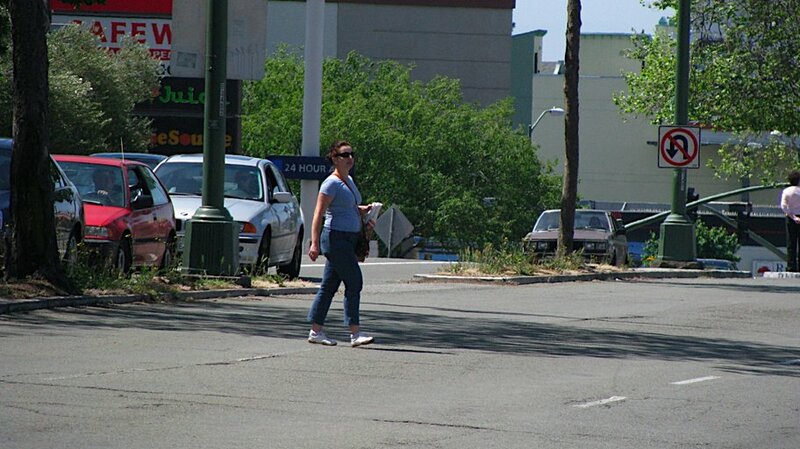 Can you spot the pedestrian? How about here, en route from from Safeway over to Wendy's? Luckily, cars yield to pedestrians here....most of the time. 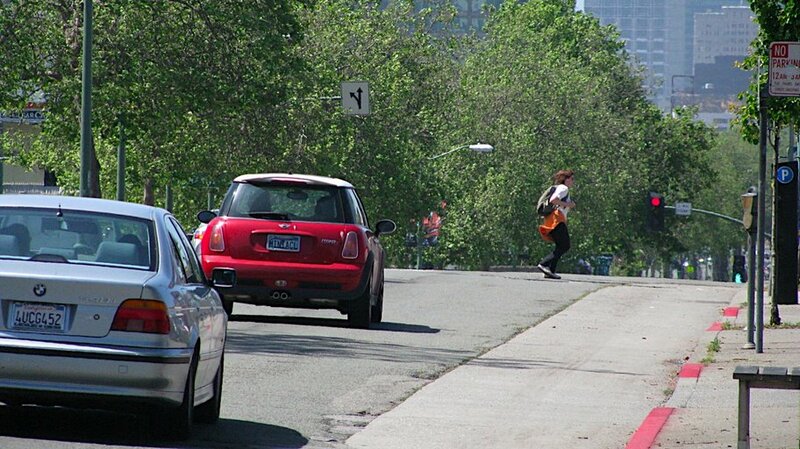 If you're gutsy enough, you can just see what happens when you step into the street. If you’re coming from College, your best bet is to turn left against traffic into the Safeway service vehicle entrance and parking lot exit, which means crossing multiple lanes of Broadway very quickly. This isn’t exactly illegal—cars periodically do it too—but it also isn’t exactly safe, and it dumps you into the Safeway service entrance, where there are occasionally huge trucks that aren’t watching for entering traffic. (There is a median on Broadway that is often used as a refuge, but it’s not intended—or wide enough—for bikes and peds, who aren’t supposed to be crossing here.) The problem is that the only other option is to continue through to the light at 51st Street and loop around to the Pleasant Valley entrance. Sure, it’s what cars do with no trouble, but it’s quite far out of the way (and up a hill) for bikers, and it drops you straight into the traffic jam that is the Safeway parking lot, with cars coming at you from five or more directions and no designated pedestrian path. So I’ll take my chances on Broadway, where at least you can see the oncoming traffic. If you’re coming from Gilbert and headed into the Safeway parking lot—the approach I like best—you’re in better shape because you have a light. 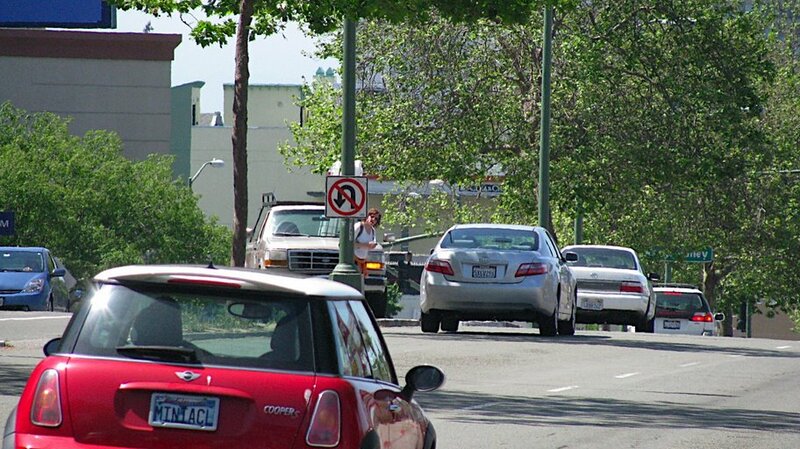 The problem is that cars are rarely watching for you, and they’re all trying to get into or out of the parking lot (or through to Piedmont or Broadway). On more than one occasion, I’ve nearly been hit by someone not paying attention when there was absolutely no question that I had the right of way and the light. Pedestrians, unfortunately, have similar challenges at this intersection. And, again, you end up in the Safeway parking lot with traffic coming from all directions, and have to cross most of the parking lot to reach any place where you can lock up a bike. Not directly a Safeway issue, but bike access from Broadway to College is something of a mess too. On the upside, there are legal ways to get to and from College—but they’re primarily designed for cars, and if you’re a biker heading north on Broadway or over to College from Pleasant Valley, you need to be brave about taking the lane to get over to College or onto 51st, and I regularly encounter drivers who are unhappy about having bikes in their midst. I often see bikers give up and use the crosswalk instead, which is fine—but which shouldn’t be required in order to get across. Safeway can’t fix this by themselves, but rehabbing the plaza is a key opportunity to make sure that the entrances and traffic patterns are in the right places to facilitate better overall traffic flow for both cars and transit and safer conditions for bikes and peds. Luckily, this isn't a U-turn. Exactly. 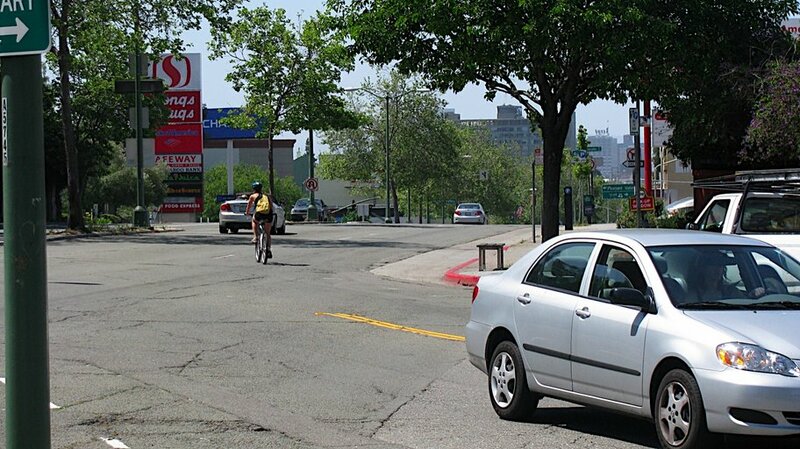 In fairness, these are all photos of bikes and peds doing bad, bad things (or at least less-than-safe things)—and there are safer, legal ways to get across if you’re willing to go a bit out of your way. But they’re indicative of some bigger problems—namely, a lack of safe, legal ways to get to and from Safeway along the paths that many, many people want to follow—none of which are addressed by the currently proposed plans. We should be holding Safeway to a much higher standard than simply maintaining the status quo. Fixing Broadway and Pleasant Valley won’t be fun, but it’s essential—and it’s likely to be the only opportunity to do it that will come our way for another forty years. Working with the City to ensure that the lane and signal configurations from the parking areas onto Broadway, Pleasant Valley, and 51st Street adequately accommodate bus routes and cyclist and pedestrian paths, especially paths to and from College and to and from the senior housing developments at the intersection of Pleasant Valley and Gilbert. Suffice it to say that Safeway should not simply be “tweaking” the existing parking configuration—which is effectively what the current proposal does. They should be rethinking it altogether, and identifying creative ways to provide convenient parking while also minimizing conflicts between bikes, peds, and drivers (because it’s no accident that the bumper-fixer dudes in the truck sit in the far corner of the lot waiting for fender benders!) They should spend some time at Whole Foods, which I actually think handled parking quite skillfully given the huge number of constraints they were working with. They should talk with the City of Emeryville to learn more about modeling they recently did to envision a new East Bay Bridge Center (where Home Depot, Best Buy, and such are located—and which, incidentally, is partly in Oakland and jointly planned). The (purely imaginary, at this point) model for a future shopping center there, developed in conjunction with Emeryville’s General Plan Update to help residents imagine what an alternate future for that area could look like, called for reintroducing the street grid and building structured parking where there is currently surface parking in order to integrate housing and finer-grained retail into the existing big-box fabric to create a true neighborhood. That plaza is a much larger area, sure—but the concept would work equally well here, and the modeling helps to explain how and why. Basically, we should be pushing Safeway to think outside the box on this one—and to understand the many ways in which developing this plaza more intensely but more intelligently will benefit both Safeway and Oakland on many levels. There are still a few days left to submit comments to the City on the current proposal. Let the Council and Planning Commission know what you think by Monday, July 27, when the 30-day public comment period on scope of the draft Environmental Impact Report (EIR) ends. For more information or to offer any thoughts, critiques, or ideas, you can contact Darin Ranelletti at the City of Oakland by phone at 510-238-3663 or by email. *All photographs in this series were taken by Paul Rosenbloom in conjunction with a Walk Oakland Bike Oakland (WOBO) project, and are used with his permission. Visit WOBO’s website to learn more about their current Bike Broadway campaign for bike lanes on Broadway between downtown and Highway 24. Oaklanders: Send back your ballots and vote YES YES YES! Ballots were mailed out to all registered voters in the city on Monday, June 22nd. IMPORTANT: If you haven’t received your ballot by the first week in July or if you’ve moved since the last election and haven’t changed your address yet, call the Registrar of Voters to have them send a new ballot or make other arrangements so that you can vote! You can also still register to vote in this election if you’re new to Oakland, but you need to do it by Monday, July 6, 2009. What is it? This measure is an increase in the Oakland Transient Occupancy Tax (hotel tax). It would increase the current 11 percent tax by 3 percent (to make the new TOT 14 percent). This brings Oakland’s tax in line with the tax in surrounding communities. The tax revenue would be dedicated to the Oakland Zoo, Oakland Museum, Chabot Space & Science Center, cultural arts programs and festivals, and the Oakland Convention and Visitor Bureau. Why yes? Oakland’s hotel tax is currently lower than those of nearby cities, so we have some wiggle room. (For reference, San Francisco’s is 14 percent, while Emeryville and Berkeley both have TOTs of 12 percent.) So I don’t foresee huge competition issues in terms of filling our hotel rooms; many travelers won’t even notice the difference. More importantly, the institutions and programs that the tax increase will support help make our city a better place to visit and to live, so my view is that the additional revenue will help the tourism industry overall. There’s also no opposition to this (even the hotel industry is on board!) so it’s pretty non-controversial. What is it? This measure would change the Kids First 2 measure (Measure OO) that Oakland voters approved last November. It is sometimes referred to as the “Measure OO compromise.” It would reduce the amount of money going to the Kids First programs from 2.5% of the total budget to 3% of the General Purpose Fund, and add a review every 12 years. Why yes? Because Measure OO was possibly the worst measure ever and desperately needs to be fixed! This fix isn’t great, but it will help. (I’d still like to see a full repeal that would identify an alternate funding source for these programs so we wouldn’t be robbing Peter to pay Paul, so to speak, but this was a Council compromise after much ado, and may be the best—and only—chance we’ll get to fix Measure OO before it takes effect.) Basically, it changes how the Kids First set-aside is calculated to relieve some of the pressure the original measure put on Oakland’s budget (and heaven knows our budget needs some help right now!) It also adds a program review process, which was a key element missing from Measure OO. You can read more about my issues with the original Measure OO here. What is it? Measure F would establish a new business tax rate for “cannabis businesses” (medical marijuana). These businesses are currently charged at the general tax rate ($1.20 per $1,000 of gross receipts). The new tax rate for these businesses would be $18 per $1,000 of gross receipts. Why yes? Well, broadly this is a good thing because it’s increased revenue for Oakland and is supported by both the medical marijuana industry and the police, who are the two major players here. (In fact, there’s no opposition to this measure that I know of.) But I also think Measure F is important because it’s a first step in recognizing the role the medical marijuana industry plays in our local economy—and acknowledging that there are associated costs and helping to cover them. What is it? This measure would change Oakland’s Real Property Transfer Tax to clarify that businesses should pay the transfer tax (0.75% of the sales tax) when they transfer real property due to changes in ownership or control of the corporation (such as mergers and acquisitions). Why yes? This isn’t a new tax; it just clarifies our existing tax so that residents and smaller businesses aren’t the only ones required to pay the transfer tax for change of ownership. This is particularly important right now because a number of large corporations are in the midst of mergers and acquisitions, so making this policy crystal clear will ensure that the City doesn’t lose out on any much-needed transfer tax revenue. *Note that not all of the area political organizations had issued positions on the ballot measures when I put this together; I’ll try to update this if I hear of other endorsements. I first heard about the 3/50 Project over at De-Victorianization on Division, a house blog out of the Midwest, but I was struck by how wonderfully this national project echoed the work that’s been going on in Oakland over the past few years with campaigns like Shop Oakland, Oakland Unwrapped!, and now Oakland Grown. And I was also struck by the fact that there is not yet a single Oakland business participating in this project—not one!—in spite of the fact that Alameda, Berkeley, San Francisco, and even Walnut Creek and Danville are represented. So it seemed like it was time to spread the word! The premise of the Minneapolis-based 3/50 Project (brainchild of Cinda Baxter at Always Upward) is that if we each picked three favorite independent businesses and spent a total of $50 across the three, we’d collectively generate $42.6 billion in revenue across the nation. (The numbers are based on the Department of Labor’s most recent employment statistics, and count only those who are currently employed.) The organizers also note the huge impact of buying from locally-owned businesses: for every $100 spent at an independent business, $68 comes back to the community through taxes, payroll, and other expenditures. If you buy from a chain, only $43 comes back—and if you buy online, virtually nothing comes back. Perhaps most importantly, buying local is about strengthening your neighborhood and your city by fostering businesses that employ local residents and generate local tax dollars. In California, this is especially important right now—while I’m not the biggest fan of our new crazy-high sales tax, it’s raising critical revenue for the state, cities, and the many programs we all rely on. (In Alameda County, money from sales tax helps fund BART, essential health care services, and a wide range of roadway, transit, bicycle, and pedestrian projects through ACTIA; local jurisdictions also get one percent of the state’s cut for services, schools, and more.) An online purchase with free shipping and no sales tax may look cheaper—but is it, truly, when you factor in the devastating effect on your neighborhood businesses and your city? 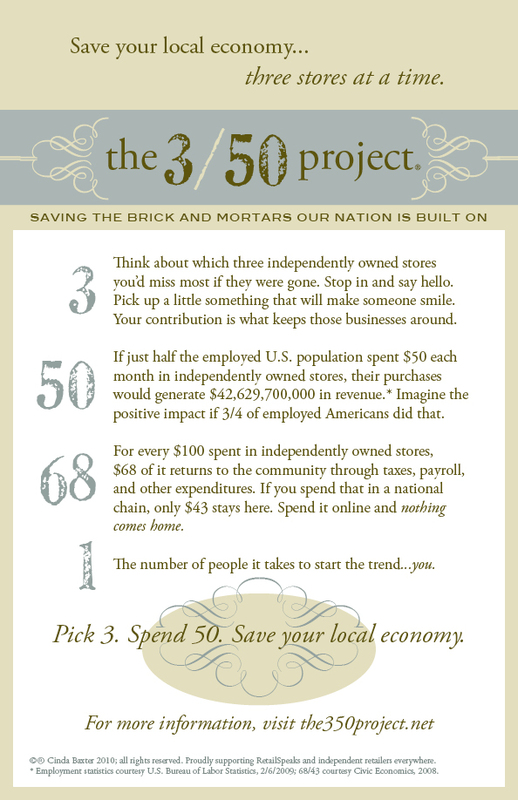 The 3/50 campaign includes badges and posters you can print and hang in your community or display online to build awareness, and local independent businesses can sign up to be listed on the website. How about it—can you commit to spending $50 across your three favorite local businesses this month? ….or at least, that’s what the U.S. Conference of Mayors says in their call for a Main Street Economic Recovery. In a report released today, the organization, which consists of the mayors of U.S. cities larger with more than 30,000 residents, outlines 11,391 jobs and infrastructure projects in 427 cities across the country that it says are “ready to go.” In total, the projects would create a $73 billion investment in the nation’s infrastructure, and would create nearly 850,000 jobs in 2009 and 2010. Document Management for PWA: Funding will be used to implement an enterprise-class document management system for records related to environmental remediation of City-owned properties. The project will leverage the City’s existing, successful investment. PWA Equipment Services Technology Learning Center: Funding will be utilized to install networking, computer, printer, projector, and related equipment to establish a Public Works Agency Equipment Services Division Technology Learning Center. Corporate–Community Partnerships: The project will encourage Oakland businesses and the City government to partner with the Oakland School District and local faith-based organizations to employ and mentor youth on a part-time basis throughout the year. E-Government Network Infrastructure: E-government enables the delivery of information and services online through the Internet or other digital means. The use of the Internet to deliver government information and services will provide benefits. Fruitvale Latino Cultural and Performing Arts Center: Federal funding will be used for construction costs (e.g., structural, mechanical, electrical, and plumbing systems, seismic reinforcement, elevator, etc.). Citywide Curb Ramp Installation Program: Accelerate installation of curb ramps citywide in approximately 2,000 locations. Various green projects: FY09 funding is requested to support the following elements of this effort: the East Bay Green Jobs Project; the Oakland Green Jobs Corps; and the Environmental Engineering Technician Training Program. Metro Area Green Institute: The Metro Area Green Institute will serve as a clearinghouse for low-carbon economic development efforts nationally. The Institute will compile and disseminate data gleaned through the existing program sand provide technical assistance. Oakland Community Land Trust: Funding will be utilized to purchase and rehabilitate foreclosed properties as an initial element of a broader Oakland-based community land trust. Rehabilitated properties will support low-cost housing for Oakland residents. Prisoner Transport Vehicles: Since the OPD Jail closure in 2005, police officers shuttle between North County, Highland Hospital and Santa Rita jail. Additional transport vehicles will increase efficiency. Automatic Vehicle Locating (AVL) Systems: Funding will be utilized to install Automatic Vehicle Locating systems on all public vehicles. Oakland CompStat: Funding will be utilized to develop, design and deploy a centralized and consolidated criminal data repository system in Oakland. Patrol Vehicle Acquisition: Funding will be utilized to increase the police vehicle fleet from 399 vehicles to 429 with Federal funding through the acquisition of 30 additional police vehicles. 311 Citizen Relationship Management (CRM) System: Funding will provide Oakland citizens a non-emergency response system by deploying the integrated CRM system using email, fax, phone and web. Enhanced Public Safety Equipment Program: The City seeks funding to install audio and video recording devices in patrol and specialized vehicles; purchase firearms, holsters, and related equipment; purchase and install Dell laptops for specialized field. Information Technology Infrastructure Enhancement: The City of Oakland requests $3.61 million in federal funding to support vital enhancements to citywide public safety information technology systems. These enhancements include: IPSS Computers [the list ends here but I assume there’s more]. Oakland Fire Boat: The fireboat responds to water emergencies and provides mutual aid assistance to other jurisdictions. The Port of Oakland is a potential terrorist target. Opening this station enhances our capability to quickly respond to terrorist attacks. Adeline Street Bridge Repair: The improvements include repair of damages in abutment No. 1 and to provide access behind abutment No. 2, replace bridge expansion joint material, and seal and restripe the bridge deck. 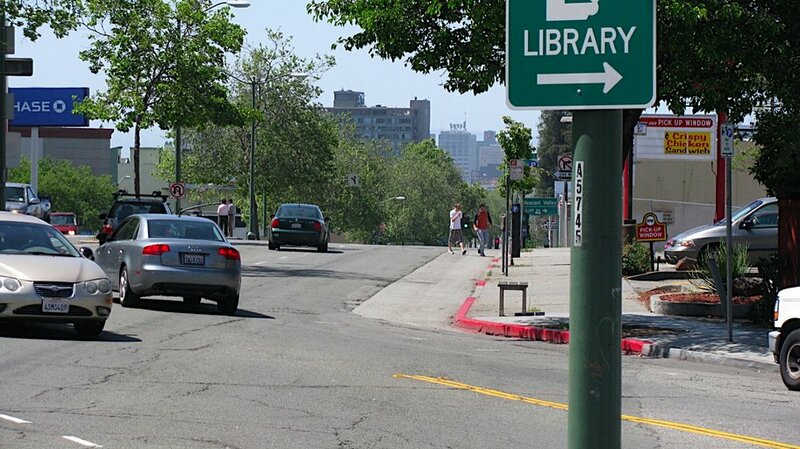 The Fruitvale Alive Streetscape Project: The improvements include construction of bulbouts, ADA ramps and installation of bike lanes, planting trees, installation of signs to improve pedestrian circulation, improvement of sidewalks and installation of streetlights…. Oakland Inner Harbor Tidal Canal Easement: The proposed easement will allow the City to construct pedestrian and bicycle trails along those portions of the waterfront located within the Harbor Tidal Canal property. Oakland Inner Harbor Tidal Canal Feasibility Study: The City of Oakland requests the authorization of $250,000 to conduct a feasibility study as an initial element of a greater effort to undertake improvements to the Federally-owned Oakland Inner Harbor. Cryer Boatworks Site, Public Beach Access: The Cryer Boatworks Site is currently being developed as a public park, and contains a section of the San Francisco Bay Trail. The shoreline is a gently sloping beach, which is a rare commodity in Oakland. That’s the list. It’s worth pointing out that this is a city-specific list, and thus there are a lot of “ready-to-go” regional projects missing from this, especially on the transit front. (Speaking of transit, where is the MacArthur Transit Village?? C’mon, Oakland, get your stuff together before it’s time for the real deal in January!) School projects are also notably missing here, perhaps because in California, school districts are distinct from cities (ours even moreso, as it’s currently under state control—though that may change soon) and therefore not always communicating well with City staff. This report does provide a great glimpse of how other cities are thinking, though. Hopefully Oakland will learn from this and get some of our bigger, bolder dreams ready to roll. A few months back, California’s legislature passed SB 375, landmark new climate change legislation that, for the first time, linked land use and transportation planning decisions directly to greenhouse gas emissions reductions. Recently, this hit our neighborhood mailing list with a fervor, with people up in arms that this law was just a ploy to increase density in urban neighborhoods. There’s a lot more to it than that, though, so I figured it warranted a post—especially as California has historically been on the vanguard of progressive environmental legislation, so it may only be a matter of time before other states see similar measures in place. First, a very big caveat: I’m a policy planner, and my job is to help cities and counties figure out what laws like SB 375 mean for them and to (hopefully) encourage them to make progressive planning and policy decisions. Consequently, I have some very strong opinions about all of this, so make of that what you will. So what does SB 375 really do for cities, then? It’s important to remember that this law is still in its infancy. We don’t yet know exactly how lawmakers or the courts will enforce it. California cities are watching closely, though. No one wants to be the next Stockton, which recently had its new General Plan shot down by the state attorney general because the plan promoted too much GHG-producing sprawl. (Stockton eventually struck a deal to intensify its transit-accessible downtown, build a bus rapid transit system, and create a climate action plan, among other things.) In the coming years, what is and isn’t required by the law will become much clearer. AC Transit BRT: Will SB 375 help it happen? SB 375 is legislation designed to help implement AB 32, the Global Warming Solutions Act of 2006, which requires California to reduce GHG emissions to 1990 levels by 2020. I’m not going to open the “what causes global warming” box—you can do that yourself. Suffice it to say that the state of California is satisfied that human activity has enough of an effect on global climate change to warrant proactively changing our patterns of development and our reliance on automobiles. Hence, AB 32 and SB 375. The California Air Resources Board (CARB) will develop GHG emissions reductions targets for each region of the state that will allow California to meet its AB 32 goals. California metropolitan planning organizations (MPOs) must develop strategies to achieve these regional targets through land use and transportation planning, even if the targets are in conflict with local plans. 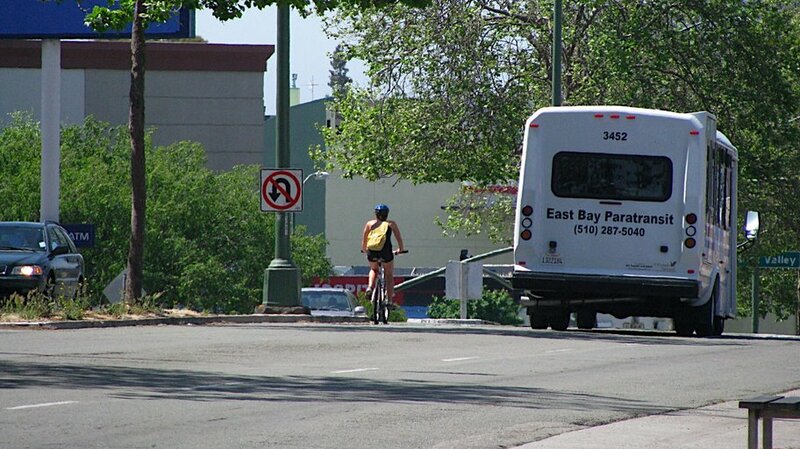 (For Oakland, the local MPO is the Association of Bay Area Governments, or ABAG.) There are a few exceptions for counties without MPOs. So SB 375 just throws local plans to the wind? Not exactly, but it does provide a big incentive for local communities to work with regional bodies as they develop their plans to ensure city plans are consistent with regional goals. This isn’t new—in the Bay Area, for instance, most cities already work with ABAG to ensure that their general plans include the city’s fair share of regional housing, and city and county transportation plans are typically developed in conjunction with the RTP. But 375 adds new carrots and sticks to the mix: it gives residential and transit priority projects access to streamlined approval processes if they’re in keeping with the regional plan, opens up new funding sources for these projects, and withholds federal transportation funding from projects that aren’t in the regional plan. Right now, there’s no indication that residential development will be forced on cities where it’s unwanted; instead, the law simply offers some compelling incentives to encourage communities to consider new development. There will likely be extensive regional conversations and negotiations to determine exactly where housing will go and who will benefit. What happens when the local and regional plans are in conflict? This is still extremely unclear. We’ll probably have to wait for this to happen and see how it’s addressed by the state and the courts. There are some precedents, however. In Massachusetts, for example, Chapter 40B (the Massachusetts Anti-Snob Zoning Act—seriously!) takes a similar carrots-and-sticks approach to encouraging local communities to build affordable housing. Under the 1969 statute, developers have access to a streamlined comprehensive permitting process when their projects contain a minimum percentage of affordable units. Local zoning boards have flexibility in approving such projects even if they aren’t consistent with approved zoning regulations, and developers can appeal to the state to supersede local zoning regulations if a municipality is not meeting a minimum threshold for affordable housing. Like 375, 40B was designed to strongly encourage cities and towns to “do the right thing” of their own accord (and more broadly, to fight NIMBYism). The law certainly hasn’t solved Massachusetts’ affordability crisis, and it’s constantly challenged—but at the end of the day, it has led to small but significant steps in the right direction. We may see similar progress from 375, although the California law arguably has somewhat bigger teeth and better incentives. What does all this mean for a city like Oakland? The short answer is that we don’t know yet. However, Oakland currently engages MTC and ABAG in its planning processes and participates actively in regional planning, so hopefully that means that the city’s general direction will be in sync with the new regional plan. Oakland is transit-rich and has countless infill opportunities, so expect the city to be a target for new residential development. That’s not necessarily a bad thing, though. Many of Oakland’s neighborhoods—and especially those on transit trunk lines (Broadway, Telegraph, San Pablo, International, MacArthur) that meet the TPP requirements—have infill potential, with formerly industrial sites like those along Auto Row opening up. And while Oakland grew out in the second half of the twentieth century, the center city neighborhoods lost population. New housing in the city’s core can potentially add new tax revenue, new shoppers, new schoolchildren, and more. All of that may translate into more federal and state dollars for various services and amenities. New housing will increase residential density in some neighborhoods, but at the same time, growth can open up opportunities for revitalized commercial corridors, nightlife, arts, parks, and more. At a very basic level, 375 is advocating reinvestment in California’s cities and downtowns, which I think will be a very good thing for Oakland in the long run. Will there be added traffic and parking headaches? Possibly, since more people may bring more cars. However, these are things that the city can (and should) regulate: implement and enforce residential parking permits and metered parking in commercial areas, for instance. Promote innovative thinking to improve transit service throughout the city. Encourage locally-based services and amenities so that residents don’t have far to go. Create an urban neighborhood where you don’t need your car to get by. The urban planner in me says I have to pause for a moment to dispel the “density is bad” myth that persists in many American cities. Density is simply a way of measuring how many people live in a square mile, or how many housing units are on an acre of land. It isn’t good or bad until you start assigning numbers and values to it. Intensity is a similar measurement, but in the urban context generally measures how many square feet are developed per acre. (I say “generally” because the terms are sometimes used interchangeably or in entirely different ways—there’s no universal definition of either, so it’s important to know how your particular city or region uses a term.) Density is not the same as building height. There are dense neighborhoods comprised of one-story single-family homes, and areas with high rises surrounded by open space that aren’t as dense. Most cities regulate building height as well, but there are different tools to measure and manage height. (Typically cities use height limits and something called a floor-area ratio, or FAR, which is a method of measuring the massing of buildings; these are combined with density or intensity zoning regulations to shape a community’s look and feel.) For the purposes of SB 375 and climate change mitigation, though, what we primarily care about is the concentration of people. In the American landscape, densification of cities has a complex and contentious history. The federal Urban Renewal program of the ’50s and ’60s saw the mass destruction of cities across the country as freeways and large blocks of housing or offices replaced smaller-scale neighborhoods. Density, intensity, heights, and massing all increased simultaneously. The redevelopment was supposed to “save the city,” but instead, the program arguably destroyed urban life in many communities. (I say this with a very strong bias, as I grew up in New Haven, Connecticut, the poster child for Urban Renewal’s failures; there are, of course, some cities in which central business districts did benefit from renewal efforts.) But we need to acknowledge this history, while at the same time underscoring that increasing density in the center city was only one small goal among many much more politicized goals of the Urban Renewal program. Let’s be clear: SB 375 is not “Urban Renewal all over again” in any way, shape, or form. What does density look like today? <1 unit/acre: Very low density; exurban or rural development; large-lot suburban development. Population density is important because that magic number determines everything from what types of businesses will be successful to how viable different types of transit will be to how much park space is needed in a community to how many seats schools need to have. More isn’t always better, but there are some thresholds to meet. Certain types of transit, for instance, will only succeed with a baseline population density nearby; similarly, some businesses won’t thrive without a minimum customer base. It’s a balancing act. This is where I hope SB 375 will be most effective: helping regions examine that balance to plan healthy, sustainable, and—above all—livable communities that have enough residents to support walkable schools, jobs, shops, and restaurants; effective transit; active recreational opportunities; and the other local amenities that can make urban living wonderful. Last, but not least….what about the suburbs? What happens to the Tracys and Antiochs of the world with SB 375 and a push to jumpstart urban areas? Only time will tell. But climate-friendly living and walkable communities certainly aren’t limited to large cities; small cities can enjoy similar amenities on a different scale. (Don’t try running a light rail through a small town, for instance—but an express bus that runs from the town center once or twice a day could be a great addition.) Moving forward, compact development patterns and new transit opportunities in the suburbs can help to preserve the open space that remains while strengthening the communities that already exist there. I do think we’ll see an end to large-scale development of suburban and exurban greenfields in California, though. And with fresh memories of $4 gasoline, increased awareness of GHG emissions, and more housing options close to jobs, it’s likely that fewer families will be choosing homes that require lengthy car commutes. Where will that lead us? What do you think our landscape will look like in a decade or two? Recycled construction materials, including steel and concrete. Kaiser has also bandied about other ideas over the course of the development process, including outdoor physical activity classes and an expanded farmer’s market. (They have one now, but it’s tiny—can North Oakland really support a third large market to compete with Temescal and Grand Lake? Hard to say, but it would certainly be exciting if so! Maybe a mid-week market has potential, a la Berkeley’s Tuesday market.) So we’ll see what other fun things the new campus may bring. Anyway, I imagine the construction process won’t be much fun, but hopefully the end result will be worth it. 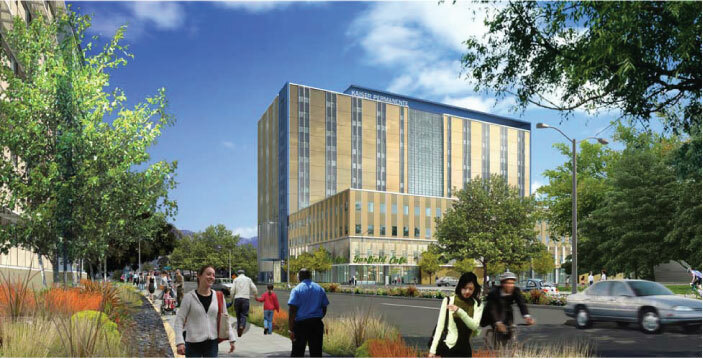 I can’t wait to see the wrecking balls take out the crappy 60s Kaiser buildings and the M/B Center—woohoo! It might even be worth becoming Kaiser members once the renovations are all done, since D. has that as an option at work. Not like we’re far from Alta Bates Summit and our current Pill Hill doctors, but still. Hmm…. You are currently browsing the archives for the Planning & Politics category.